Ellesmere Port-based AWS Ltd, who acquired certain remnants from the Bramwith Motor Company in 2010, an operation that had also been known variously as Vintage Motor Company, Vintage Classics, Heritage Motor Company, Asquith Vintage Classics et al, over the years, now produce the Branford Elite model. The car is proving popular with the wedding hire fraternity, although has hitherto only been available in fully built guise until now. The seven-seater also now uses BMW 3-Series donor and can be had in kit form, priced from £10,560 inc VAT. AWS boss, John Ford, reckons that a DIY budget of around £25,000 will see an Elite on-the-road and parked outside the church. John has also announced a series of kitcar building courses that are divided into four two-day courses and a single day seminar priced at £250 per day and covering all elements of skills and techniques needed during a kitcar build right up to IVA preparation. 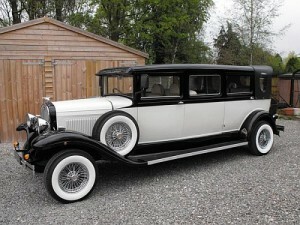 More information on all aspects of the company’s activities are available via www.vintageclassiccars.co.uk or 01244 880 151 ENDS. Print article This entry was posted by admin on April 18, 2013 at 6:17 pm, and is filed under News. Follow any responses to this post through RSS 2.0. Both comments and pings are currently closed.